WMF platters leave nothing to be desired: being made of hard porcelain or Cromargan® stainless steel, the platters are durable and hard-wearing, and look great too. Even back in the Middle Ages, platters were an essential element of sophisticated tableware. Four hundred years later, practical platters are still just as indispensable in modern kitchens. Platters can therefore be used in the traditional way for serving and presenting, but can also be used as stands in the oven or microwave. WMF platters truly offer you a wealth of possibilities, as they can also be used as lids or pot stands. Choose the materials that best match your table settings. WMF has all kinds of different platters in its range, which means you will always find the perfect one for you! Whether round, square or oval - in this category you'll find the right platter for every occasion!  At WMF, we are always looking forward. Our platters are made to ensure that you'll be happy with them for many years to come. A majority of these practical platters are made of the highest-quality porcelain, and made in Germany, of course. They impress with their versatility, meaning you can use WMF platters both in the microwave and in the oven. You can use them to reheat stews, keep food warm or provide a place to gather scraps at the table. Of course, the porcelain platters are dishwasher safe and therefore very easy to clean. The platters made of Cromargan® 18/10 stainless steel are also dishwasher safe and, thanks to their modern look, can be combined with a variety of other tableware items. They are also ideal for use as plate trays and cake plates. Every WMF platter is suitable for everyday use. The hard porcelain platters offer high impact resistance to protect the edges and a particularly hard glaze makes them scratch-resistant. Our stainless steel platters impress thanks to their modern design and taste-neutral materials, and ensure absolute hygiene thanks to seamless manufacturing. All WMF platters can be stacked to take up less space in your cupboards. The individual platters can be purchased in different sizes and shapes. Explore the platter category now, and purchase a high-quality addition for your household!